Digital supply chains and digitization of business processes in general, have a huge impact on business success. Boston Consulting Group’s report, Three Paths to Advantage with Digital Supply Chain, illustrates the urgent need for companies today to transition to a digital supply chain. The report brings good news… and a dire warning. Definitions vary, but Capgemini has useful definition that I think captures the essence of the concept. Traditional supply chains rely on a mix of electronic and paper-based processes and documentation. The organizational structure is often characterized by functional and geographic silos which do not share information openly, thereby leading to sub-optimal performance. Digital supply chains, on the other hand, have the capability for extensive information availability, and enable superior collaboration and communication across digital platforms resulting in improved reliability, agility and effectiveness. The distinguishing feature of digital supply chains is their “connectedness.” Rather than siloed and fragmented as is the case with typical ERP systems; data, with digital supply chains visibility, workflows, etc., are seamlessly integrated. “Supply chains” is a poor designation for this, and far more appropriate for the traditional supply chains than the new “digital supply chains.” The new, connected “digital supply chains” are customer-centric networks rather than chains; all parties are equals, privy to a “single version of the truth,” and capable of collaborating with all other parties in the network to serve the end-customer. Digitization: What Do You Need to Do? BGC identifies three key strategies that separate the leaders from the rest and that will help you focus your efforts and not get overwhelmed. Fix Performance Gaps – use digital supply chain to handle the most laborious and important tasks, such as providing critical analytics, calculating optimal inventory allocations, and forecasting demand more accurately. Advanced technology today is capable of automating many supply chain processes, and “process robots” can continuously and incrementally optimize the supply chain as demand and supply conditions change. Disrupt the Supply Chain – find new opportunities to reach customers and speed up delivery. For example, companies can easily reach consumers directly, via ecommerce, their own estores or by using established and proven marketplaces like Amazon and Alibaba. Many-to-many networks are particularly relevant here. With every participant in the network potentially connected to every other participant, the network is rich with opportunities. Many-to-many networks are a vast “inter-enterprise social network,” perfect for finding new trading partners, sharing infrastructure and costs, achieving end-to-end visibility, and collaborating across trading partners to deliver superior service to the consumer at lower total cost. 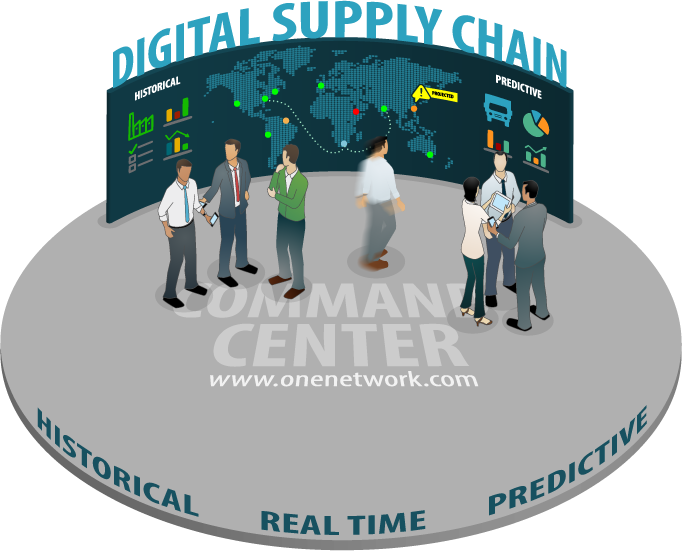 Incidentally, the “connectedness” and unity that is the bedrock of the digital supply chain, is why my company was named “One Network.” You’ll find many of the themes of the digital supply chain discussed here. Digital Supply Chains: What's the Big Deal? Digital Supply Chains and digitization is getting a lot of attention. Nigel Duckworth explains why companies need to digitize or pay a hefty price.